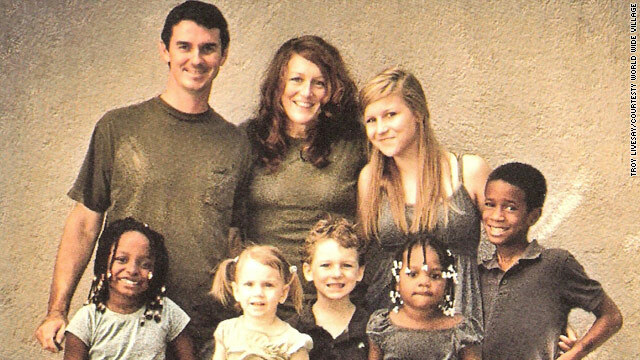 Missionaries Troy and Tara Livesay and their large family live in a less devastated part of Port-au-Prince, Haiti. (CNN) -- An American missionary family living in Haiti has been providing virtually nonstop reports about the devastation from Tuesday's earthquake and tracking down information on others serving there. "There is no way to even begin to share the things we've heard and seen since 5 p.m. yesterday," Tara Livesay wrote on the family's blog Wednesday morning. "To do so would take hours that we don't have to give right now. Some of them feel wrong to tell. Like only God should know these personal horrible tragedies." Tara and Troy Livesay are country directors for World Wide Village, a Minnesota-based charitable organization providing Christian education, health care, nutrition and micro-enterprise opportunities to children and families in Haiti. "Sometimes life in Haiti leaves you wondering 'Where are you God?' and other times we witness miracles with our own eyes," they write in their blog profile. Besides Troy and Tara, the household in Port-au-Prince is made up of daughter Paige, 15, and "the crew": Isaac, 8, Hope, 7, Noah, 5, Phoebe Joy, 3, Lydia Beth, 2, Annie, also 2, and Peanut the dog. Some of the children are adopted. Daughter Britt, 19, lives in Texas with her husband, Chris. Finally, there's Tipap, Troy's assistant, security chief and all-around handyman, who lives at the World Wide Village Guest House. The Livesays see themselves and their efforts as "a work in progress -- trying to make the love of Jesus known while learning to know Him better ourselves." That work since Tuesday evening has been consumed by gathering and reporting information about the quake and accounting for missing missionaries and other people. "... covered in dust and debris ... we saw a few bodies that had been pulled out of the rubble laying dead in the sidewalk ... many others injured"
"Church groups are singing throughout the city all through the night in prayer. It is a beautiful sound in the middle of a horrible tragedy." "The worst damage is in Carrfour (South of Port, near the Palace) we are hearing that many two and three story buildings did not make it." "Tipap made it home from Carrefour - saw many dead bodies and injured along the way - said most buildings w/more than one story are down." "The Haitian people are out praying together -- aftershock happening right now." "The few things we can confirm -- yes the four story Caribbean Market building is completely demolished," she posted. "Yes it was open. Yes the National Palace collapsed. Yes Gov't buildings nearby the Palace collapsed. Yes St Josephs Boys home is completely collapsed. Yes countless countless - countless other houses, churches, hospitals, schools, and businesses have collapsed. There are buildings that suffered almost no damage. Right next door will be a pile of rubble. "Thousands of people are currently trapped. To guess at a number would be like guessing at raindrops in the ocean. Precious lives hang in the balance. When pulled from the rubble there is no place to take them for care Haiti has an almost non existent medical care system for her people. "I cannot imagine what the next few weeks and months will be like. I am afraid for everyone. Never in my life have I seen people stronger than Haitian people. But I am afraid for them. For us. "When the quake hit it took many seconds to even process what was happening. The house was rocking back and forth in a way that I cannot even begin to describe. It felt fake. It felt like a movie. Things were crashing all over the house. It felt like the world was ending. I do not know why my house stands and my children all lie sleeping in their beds right now. It defies logic and my babies were spared while thousands of others were not. "There are friends and co-workers that are missing. People whom no-one can account for. People we work with and love. There are more than I can name, but in particular we wait on one single friend who lived near the Hotel Montana -- which has reportedly collapsed." "The horror has only just begun and I beg you to get on your knees -- I truly mean ON YOUR KNEES and pray for the people of this country. The news might forget in a few days - but people will still be trapped alive and suffering. Pray. Pray. Pray. After that - PLEASE PRAY."